The Anison Love Summit event took place inside the T-shirt Love Summit flea market event. This was a market where many vendors sold T-shirts. It took place in the first floor of the Kagaku Gijutsukan. At the edge of the market, there was a special stage which held a couple events during the day. The stage was a very dimly lit and had a low stage with a table. There were six or seven rows of seats for the audience. 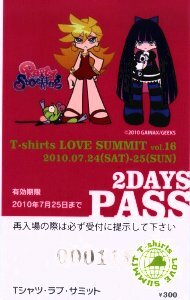 One of the events was the "Anison Love Summit", which was mostly a talk show about anime/game songs, by the four main guests. The four main guests were Kimura Keisaku (otaku writer), Mikako (idol), Higa Moeru (professional otaku), and Masumoto Kazuya (Gainax producer). In addition to the main guests, nine members (out of ten) of the new seiyuu group Maru Maru Gakuen Housoubu appeared to sing some anime songs. This was their first event. The Anison Love Summit event was around two hours and flowed as follows. Each of the four guests counted down their top five favorite anime songs. They showed the anime op/ed video on a video screen. Then after each guest finished, the Maru Maru Gakuen Housoubu girls came onto the stage, and sang one of the songs from the top five list. The songs were as follows. This was sung by just three of the girls: Itou Asuka (lead vocals), Nishizawa Kana, and Amano Miki. Before the song, all nine girls (and Asuka) introduced themselves. This was sung by five of the girls, and the other four girls danced. The singers were Amano Miki, Yahara Tomoko, Tagaki Yuki, Takayashiki Haruka, Nishizawa Kana. The dancers were Shiotsu Saori, Ueda Nao, Megumi Shinya, Hino Kanako. The nine girls started to sing this (it opens with some narration), but then a deep male voice came over the speakers. Then Shibata Hidekatsu walked to the stage from the back of the audience. Hidekatsu was the one who did the original narration for this song. He is also the president of the seiyuu production that all of the girls belonged to. Then the girls sang the song from the beginning, starting with Hidekatsu's real narration. After the song, Shibata Hidekatsu stayed for a short talk show. For the 3rd and 4th songs, all nine girls were on the stage, but only four of them had mikes. The ones with mikes were Nishizawa Kana, Amano Miki, Shiotsu Saori, and Ueda Nao. The entire Anison Love Summit stage was around two hours. For the first three songs, all of the girls wore non-matching white outfits. It was probably their own clothes. For the last song, all of the girls wore the black T-shirts that they were selling. Asuka wore the black T-shirt for her song. Before and after the stage, the Maru Maru Gakuen Housoubu girls set up a table to sell some goods. They sold the followings goods. two types: black with white lettering, black with pink lettering. By buying both packs, you got one photo of each girl. In addition there were two different group shots of all nine girls. I just bought the two packs of girls to get one photo of each girl. Each girl signed the photo and I was able to get a photo of each girl holding her own photo. I only brought my 20D and EF24-105F4L IS lens, and my compact camera (Powershot S90). Photos and videos allowed of the stage (talk and songs).